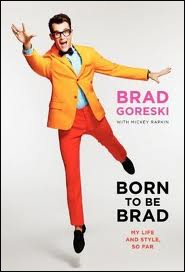 BRAVO Television breakout star Brad Goreski will sign copies of his new book Born to be Brad: My Life and Style, So Far on Wednesday, March 7, from 5 to 7 p.m. at the Barnes & Noble at FIT bookstore, located at 227 W. 27 Street, New York, New York. Fans know Goreski as the fun-loving former assistant to Rachel Zoe and as a top celebrity stylist and fashion trendsetter, but few know the story of how he got there. Now, Brad – whose own BRAVO show, It’s A Brad, Brad World, just premiered in January – shares his inspiring journey, taking readers inside his childhood in Port Perry, Ontario, to the glamour of dressing Hollywood’s A-list stars. The Fashion Institute of Technology (FIT) is a State University of New York (SUNY) college. Founded in 1944, it is New York City’s internationally recognized college for design, fashion, art, communications, technology and business and has an enrollment of more than 10,000 students. Its notable alumni include fashion designers Calvin Klein, Michael Kors, Carolina Herrera and Director Joel Schumacher.